Is it as bad as they say? Rem Oil has a bad rep.
Until one of the readers came to me with a review request. What is is that people are complaining about? And is Rem Oil really as bad as people say? Rem oil is a superior lubricant for firearms. You use it to lubricate your guns, as well as to protect them from corrosion. Rem oil is not a solvent. Rem Oil is not a CLP. It’s a lubricant – and it works different from CLP’s and solvents. Most gun oils work fine, if you use them according to instructions. Including Rem Oil. Every top brand will be 99% good enough for your needs. Unless you are a competition shooter, or you have unusual weather conditions. If Rem Oil’s so good then why does it have such a bad reputation? I’m certain that the people complaining about Rem Oil are simply using it wrong. There’s no other explanation. 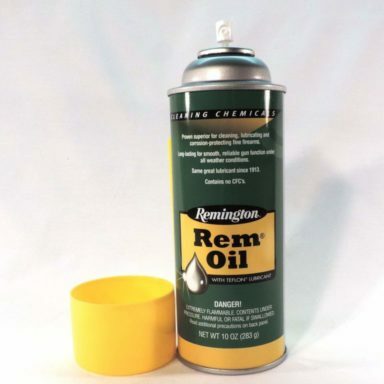 You need to wipe everything off because Rem Oil is a surface treatment. What this means, is that the only useful part of the oil is the one that sticks to the surface of your gun. Any Rem Oil NOT stuck to the surface is useless. After proper application, the surface should appear dry. It shouldn’t have a “wax coating”. This may seem unnatural, but that’s the proper way to use this product. You’re basically seasoning the surface as you would do on an iron skillet. The problem that most people have with Rem Oil is that they put TOO MUCH OIL on their gun. The oil that doesn’t soak in runs off the gun. That’s where the bad rep comes from – that Rem Oil is “runny”. Rem Oil needs to soak because of how it’s made. Rem Oil has a mineral oil base. Same as most other gun oils. What makes it different from some is the added Teflon. Teflon transforms into a super-thin film on your gun’s surfaces. The thin film decreases friction and acts as a barrier against corrosion. The Teflon membrane sticks to the gun and can’t be wiped away. It’s the protecting factor of Rem Oil. You won’t see it, but it’s there after treatment. 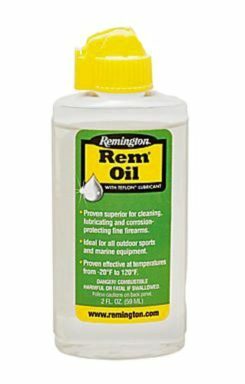 Is Rem Oil worth the money when compared to other gun oils? Well, let’s start from the good. One thing that Rem’s good for is Rust Protection. There was a comparison I read a few years ago. Rem Oil received superior ratings for rust inhibition in comparison to Hoppes’s and Breakfree CLP. The same test also ranked Rem Oil as #1 gun oil for extreme cold. I’m talking about minus 20-30 degrees kind of cold. All other oils would gum up and slow the action down. You’ll probably never shoot your gun under those conditions, but it’s still good to know. From the specs alone, these two should be equally good. Both are lubricants, and both are quite thin and runny. Rmcoil doesn’t have teflon in its formula, so I would pick Rem Oil over it. Couldn’t find any proper comparison video, so let me know in the comments if you have anything. You can see that Hoppe’s No. 9 performs significantly better than Rem Oil when it comes to solvent capability. Click the play button and see the comparison for yourself. Side note: I’ve always liked the precision tip bottle of Hoppe’s 9. It makes the oil easy to use. You don’t get that with REM oil. According to the video below, Rem Oil and Froglube perform about the same. Ballistol is generally regarded as better than Rem Oil. Rem Oil doesn’t emulsify in water. It acts like a normal oil – you put it in the water, and sticks to the surface. Ballistol emulsifies in water. It will spread out in water, and won’t rise back out on the surface. It becomes a part of the water. So, Ballistol has an advantage. It remains on your gun after you clean out the water. Protecting your barrel from corrosion. 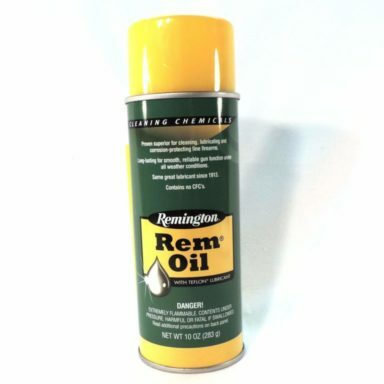 Rem Oil performs best you use it to wipe down the outside surface of the gun. Even though there are better all-rounder gun oils out there, Rem Oil is one of the best for rust protection. It’s not that good for lubing the moving parts inside the gun that get heated. For the insides of your gun, you’re better off sticking with a proper CLP (such as Ballistol) or solvent (Hoppe’s #9). As I’ve mentioned above, it’s normal for Rem Oil to ‘dry’ inside your gun. I don’t know about you but… I want to know that there is a layer of something inside my gun when I’m shooting. And that’s just not the case with Rem Oil. Can you use Rem Oil on wood? No, you can’t use Rem Oil on wood. Be careful around the stock of your gun. What happens is that the oil will soak in and ruin the wood where it meets metal. Gun oil will ruin the wood. Not at once. But over the years it will soak in and make the wood soft and punky. It usually happens where the stock meets the receiver. First the wood gets a dark stain, and then it starts getting soft. You have to be real careful to keep gun oil off your stock. It’s a common recommendation to store your firearm muzzle-down for that exact reason. It keeps the gun oil from running into the stock. Side note: Storing your firearms muzzle-down is a precaution. If your gun oil runs at all, then you’re using too much of it. All 3 contain the same teflon formula. The only difference is the form. Aerosol spray is the most common. It’s also the one that I used to spray the outside of my gun. In my opinion, the spray is the easiest to use. Liquid is the cheapest of the three. Straightforward to use – just put some drops on your gun and you’re set. Be careful not to put too much. Rem Oil Pop Up Wipes are more convenient for field use. If you’re out hunting and need something to clean your firearms, these are great to keep in your shooting bag. They’re easy to use – just wipe down your firearm with it. Down the barrel or on the surface – wherever it’s needed. One pack comes with a dozen wipes or so. One wipe can clean more than one firearm. A common trick is to cut them in half to save money. Note that the wipes are more expensive than the liquid and the spray. Which ones should you get? It’s really a matter of preference. If you ask me, I’d say that the spray is the most versatile of the three. Can’t go wrong with the spray. Rem Oil is alright. It’s not too bad, not too good either. Rem Oil is inferior to other gun oils on the market. I’ve used Hoppe’s #9 for years. It’s tried and proven for gun cleaning, removing powder and small amounts of copper residue. I prefer to use Break-Free CLP for gun cleaning. It’s cheap and a large can will last you a long time. For heavy duty stuff, Hoppe’s #9 has never failed me. And only after the treatment, that’s when I wipe everything down with Rem Oil. Let me know in the comments if I missed anything, or if anything needs to be added to the article. I always thought that Rem Oil was too runny. I switched to ballistol and haven’t looked back. People also use motor oil. Hi Ted, thanks for chipping in. I’ve heard about using motor oil for lubing guns. Haven’t tried it myself though. If it’s true, it would save a lot of money. I’ll do some research and maybe write a separate article about that in the future. Loved what you did here! Good Job 🙂 P.S. i use rem oil and love the way it makes my glocks feel good and slick.